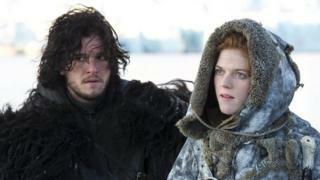 Game of Thrones stars Kit Harington and Rose Leslie are due to marry in the north east of Scotland on Saturday. The wedding will take place at Wardhill Castle, owned by actress’s father, Seb Leslie. Speaking outside the castle, Mr Leslie, an Aberdeenshire councillor, said he was “absolutely thrilled” for the couple on their big day. Fellow Game of Thrones cast members Emilia Clarke – Daenerys Targaryen – and Peter Dinklage, who plays Tyrion Lannister, arrived in Aberdeen on Friday.